The premise of this latest work from established fringe theatre playwright Ian Buckley is rather brilliant. The play contains all the ingredients for an exciting and thought provoking piece of new theatre, one with the potential to bring fresh perspective and new emotional depth to cold historical fact. The year is 1940. The setting of Nazi occupied Paris, with its atmosphere of dark political intrigue and vengeful subterfuge provides the perfect backdrop for an exploration into the enduring value of art, amid the devastating impact of war. Based on true events, the dim lit subterranean venue of the Baron’s Court makes the perfect stand-in for the Parisian bank vault where Nazi Soldiers Frisch (Roberto Landi) and Hebbel (David O’Connor) have been called to inventory artworks. As the title suggests, they find themselves pitted against the wit and ingenuity of none other than Pablo Picasso (Gary Heron), arguably the most prolific artist of the 21st century. Along with many others, he was also an artist whose modernist work was despised by the Nazi regime, and who was singled out by Hitler as being a ‘Bolshevik degenerate’. Indeed, many of his works and those of his contemporaries Dali, Legar and Miro were later destroyed in a massive bonfire. Within this highly strung atmosphere the resulting psychological tussle between the three makes for absurdly comic viewing. However there is a graver point here, which the play promises but doesn’t entirely deliver. How did the creative spirit endure in a culture of fear and totalitarian conformity? 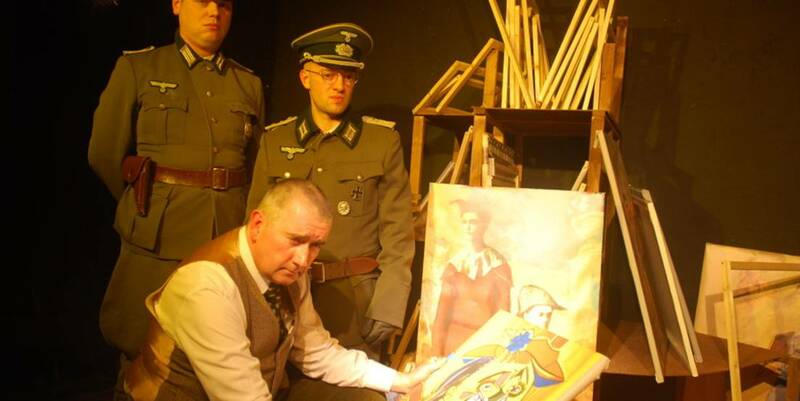 The Nazis were notorious for organised looting and art theft. The atmosphere of menace ought to have been more palpable. Despite the play’s ‘artful’ intent, rallies of verbal chess and psychological trickery, the Picasso of this play sounded more like the artful dodger than iconic genius. The Nazis were soft caricatures, bordering on the ‘Allo ‘Allo school of villainy, and because of this much of the sense of jeopardy was lost and with it the play’s intellectual integrity. Gary Heron’s Picasso only manages to tie it together briefly at the end when he reflects that he has to be “Artful as sin, as artful as them” in order to survive. Even this left the audience with a bitter aftertaste, that essentially no one can be trusted, which doesn’t say anything authentic about the genius of Picasso, but more wallows in the failings of human nature. Yet the acting is solid across the board, with a great deal of physical humour and a particularly strong performance by Roberto Landi in his stage debut as the nervous and sinister Frisch. The set, with its racks of framed Picasso prints, is visually engaging. The lighting design heightens the warmth and intimacy of the small space, making for a memorable dramatic entrance by torch light. Overall an enjoyable, well-acted play, with some original insights and humorous verbal rallies, but which however promises more than it delivers. Picasso’s Artful Occupation will doubtlessly become tighter with each performance.